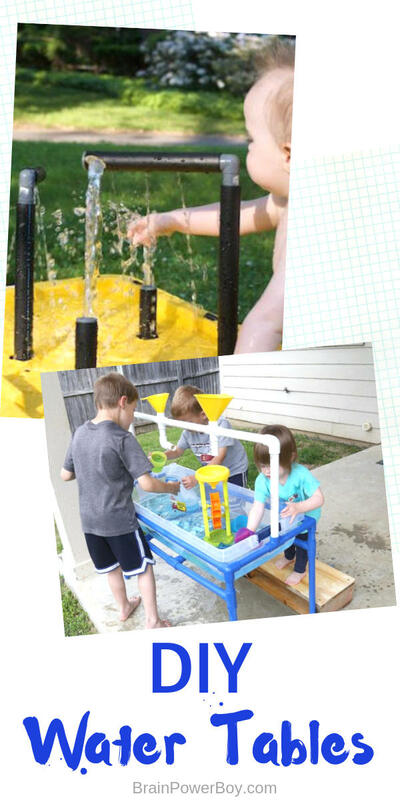 DIY Sand and Water Tables You Need in Your Backyard! In the summer time it is wonderful to get outside and play with water and/or sand. 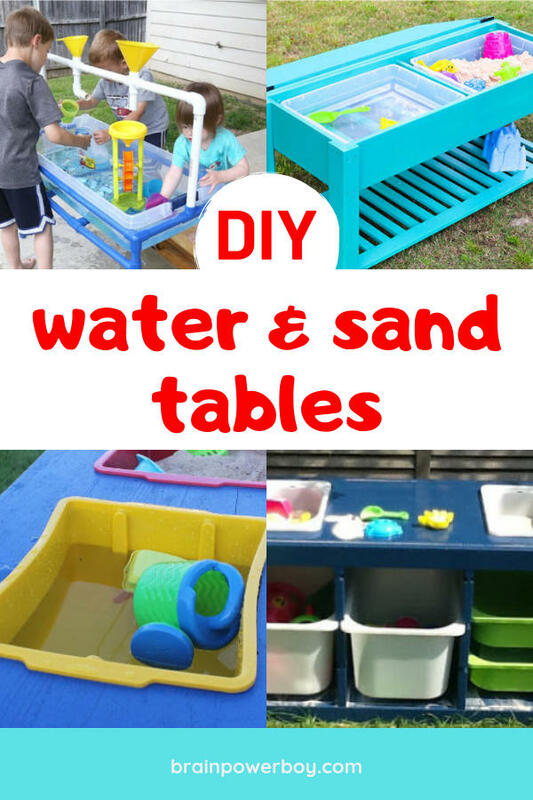 One of my favorite ways of doing that is with sand and water tables. 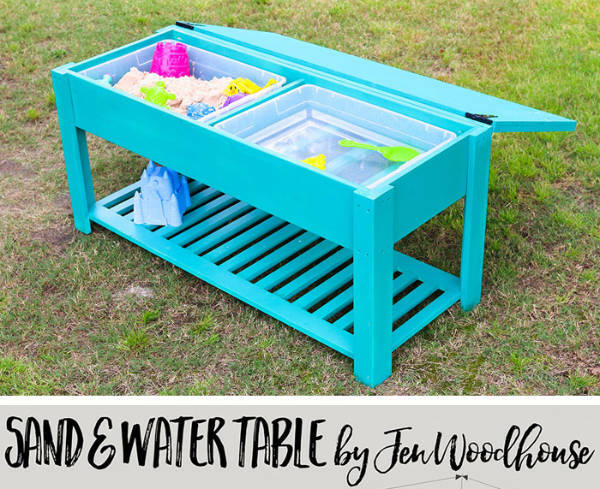 Some of the tables I have selected are just for water and some have bins for water and sand. Do keep in mind that you do not have to limit yourself with these tables. You can use a whole lot of different things for them to play with. They are super versatile! I’ve come up with a short list of ideas for you to use in the water tables. 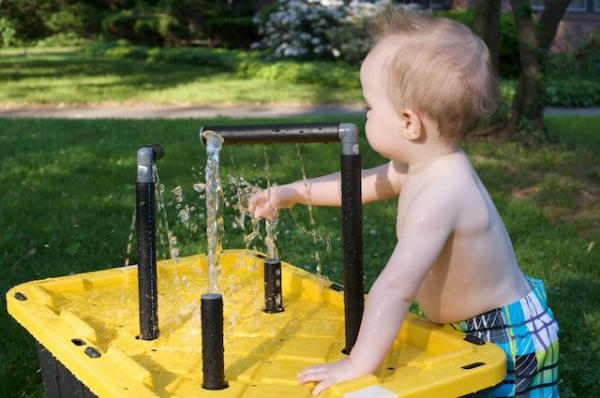 Think of them as fun water table add-ins. If you have water you can add in a little bit of blue water coloring to add to the fun. Try rice! You can even make colored rice to make it more interesting. Use something squishy like slime or oobleck. You may want to put a tarp down, depending on where you are using the table. If it is extra hot outside, some ice cubes would be perfect to add in to the water. Or, fill the whole bin with ice and grab some salt for your kids to sprinkle on it to help it melt. 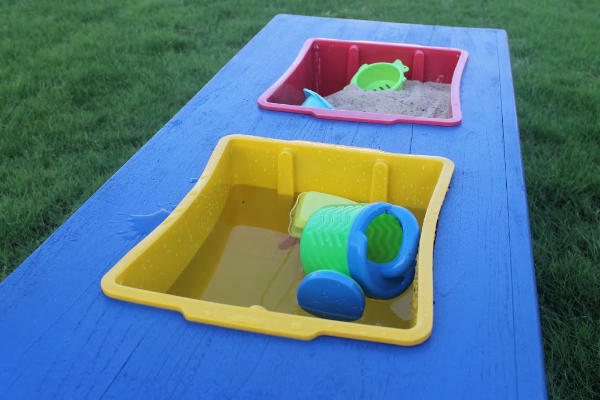 Use toys such as funnels, sieves and scoops for sand, water, try some or other fun options as well. One thing we loved to do in sand was to fill a ketchup bottle with a mixture of sand and water to use to make designs or mini castles. There are so many fun ways to use them! 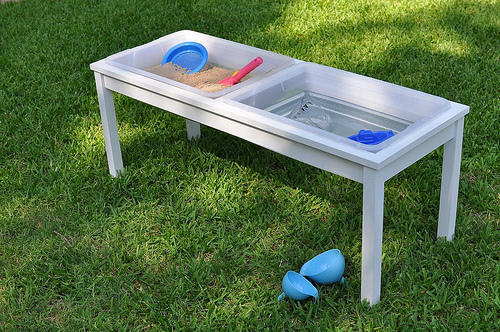 Some of these tables are just for water and some have two containers so you can put sand in one and water in the other. 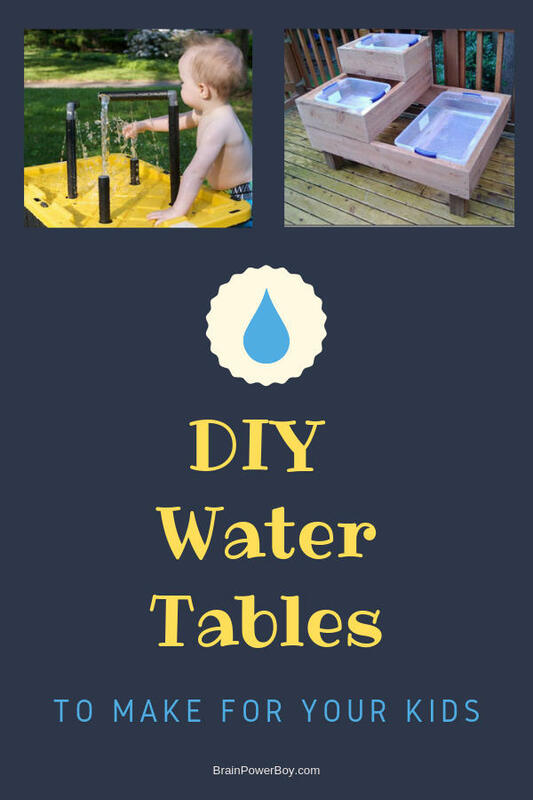 Be sure to check out the table with water bubbling up! It is way cool. Oh my goodness, but this one is a looker. I love that color of blue! The features are awesome as well. With its two containers you can do sand and water or fill both with either one. So clever! They took a utilitarian cement tub, built a wooden frame and made a water table for their toddler. Brilliant! 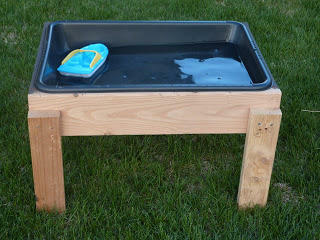 If you are looking for a kitchen sink project for the backyard, you have to try this. 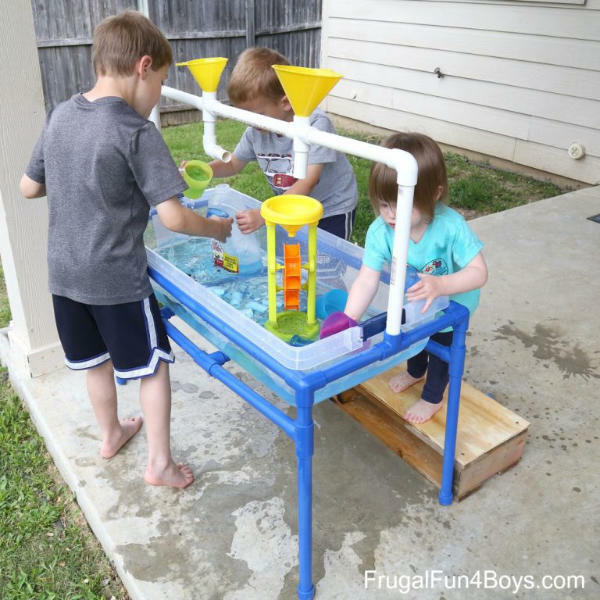 I really like it and think kids would get so much use out of it for water play but also for imaginative play as well. 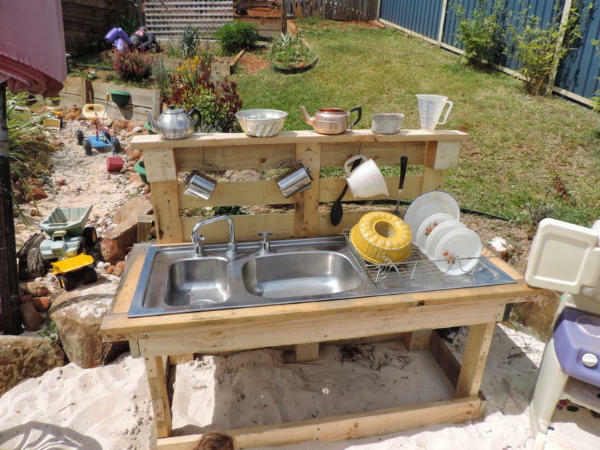 It would make a fabulous mud kitchen. 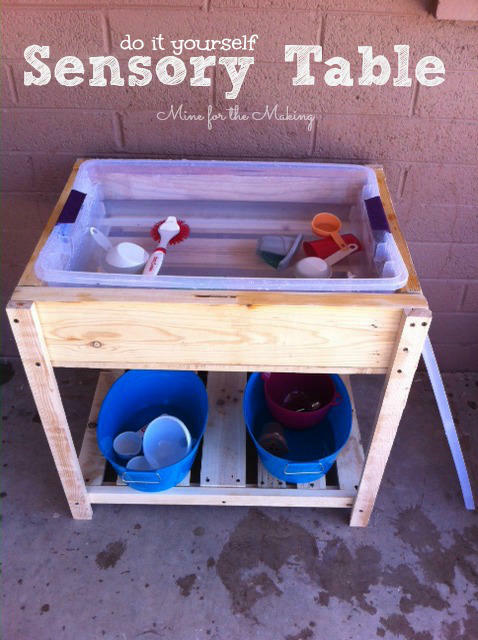 This water table is all about sensory play. 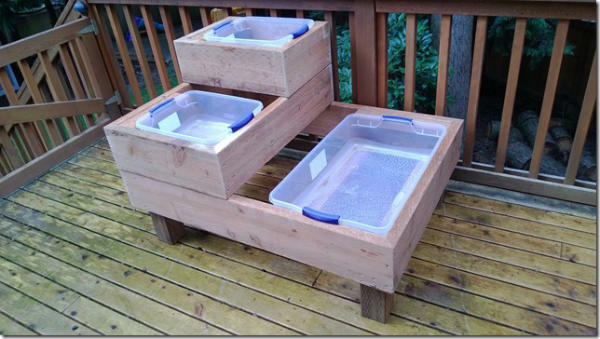 The nice wooden stand is made from a pallet and they added a simple plastic bin to hold the water. If you like to add a bit of style to your backyard, try this farmhouse style option. It is pretty great looking. I so wish I had seen this when my son was little because I would have totally made it for him. Going to water parks is a lot of fun and one thing that little ones are always attracted to is the water bubbling up from the holes in the ground. This is that type of water play at home! 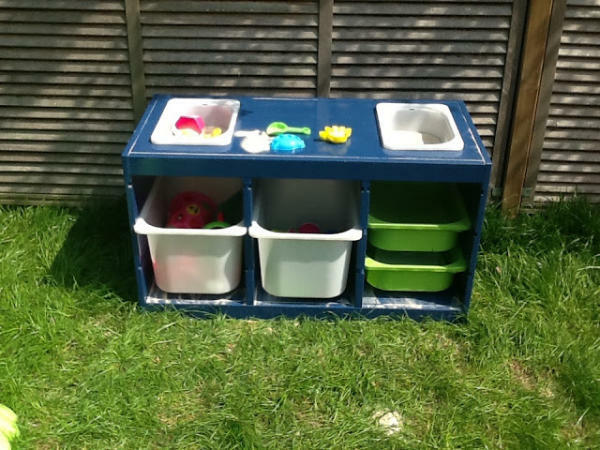 Take an old coffee table, give it a coat of paint if needed and drop a couple of plastic bins into it and you have a great idea for a play table. This is a must see table. It is really well done and your kids will love it. There is one large bin so one needs to use either sand or water at one time. This three level table is pretty slick looking. I like that it almost has a waterfall style to it. I had to include an IKEA hack table! This one is made out of the TROFAST.